Plantar fasciitis is an inflammation of the plantar fascia (thick band of fibrous tissue) at the insertion into the bottom surface of the heel bone. In a small percent of people a spur develops at the insertion of the plantar fascia. The pain is due to the plantar fasciitis and not the spur. Faulty foot mechanics such as abnormal pronation (feet rolling in). This causes inflammation and pain. X-rays may show a heel spur. 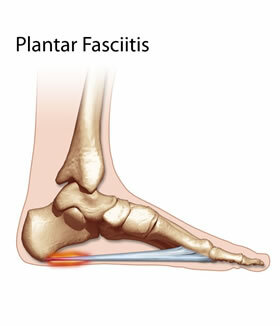 Plantar fasciitis causes the spur. The spur itself does not produce the pain. The orthotics prescribed and designed by the podiatrists at the Heel and Arch Pain Clinic (affiliated with Beyond Podiatry) are made to align the foot in the correct posture. This will reduce excessive pulling and tearing on the plantar fascia and heal the tear and inflammation at the insertion into the heel bone. We incorporate a strapping technique specifically for plantar fasciitis, which combines the use of padding and sports tape. Stretching exercises for the foot and calf muscles. Anti-inflammatory medications: only if this does not have adverse results with the patient's current medication. All weight bearing activity including sport, walking, standing for long periods should be reduced until you are pain free. We work with many shoe shops that specialise in shoes for painful feet and orthotics. The local injection of corticosteroids can give temporary or permanent relief. The injection should be performed under ultrasound guidance to ensure accuracy of the insertion of the needle. Patients should be aware that local cortisone injections weaken tissue and can result in further tearing of the plantar fascia. Cortisone injections will be organised as a last resort. Modern and minimally invasive surgical procedures should only be used to treat recalcitrant plantar fasciitis. Surgery will only be offered after we have exhausted all conservative treatments. 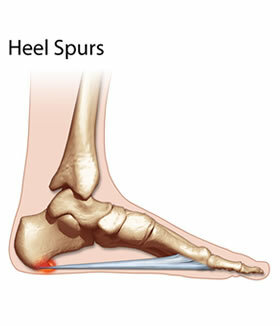 A heel spur is a bony growth under the heel bone. Heel spurs result from excessive pulling and tearing along the plantar fascia (thick band of fibrous tissue) that inserts into the bottom surface of the heel bone. This results in plantar fasciitis (inflammation at the insertion of the plantar fascia) and is the cause of the heel pain. This is usually caused by a biomechanical imbalance in the foot. Therefore, a spur is the end result of excessive pulling on the plantar fascia and not the cause of the heel pain. There are multiple causes of arch pain. 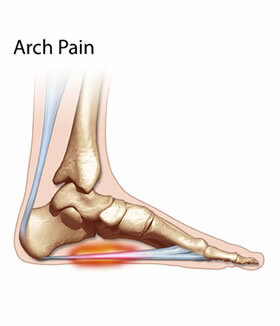 The most common causes of arch pain are poor foot posture, injury and plantar fasciitis.